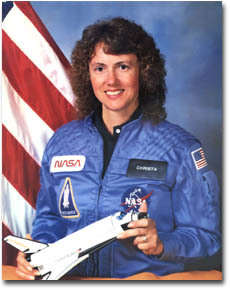 (1948-1986) Christa McAuliffe was selected from over 11,000 applicants as a payload specialist astronaut for the Teacher in Space program in 1985. She planned to teach two lessons from Space Shuttle Challenger. In 1986, the space shuttle experienced a fatal launch, taking the lives of all seven astronauts aboard, including Ms. McAuliffe. She was previously a teacher from New Hampshire, teaching social studies, American history, and other classes.